This sandwich almost didn’t happen. You see, it almost cost me the tip of my finger. Well, the jury is still out on the last part but at least my doctor said this morning that I wouldn’t need stitches. This is what I get for underestimating a mandoline. I wanted perfectly thin, uniformly-sliced vegetables for my pan bagnat and all was going well until I got to the cucumbers. The vegetable holder that came with the mandoline wouldn’t hold the cucumber so I decided not to use it. BIG. MISTAKE. In trying to get one more thin slice out of my cucumber my hand slipped. Then the blood–and tears–started flowing. “D” is for Dummy. I’m glad you can’t see it emblazoned on my forehead right now. At least this sandwich was worth the pain. 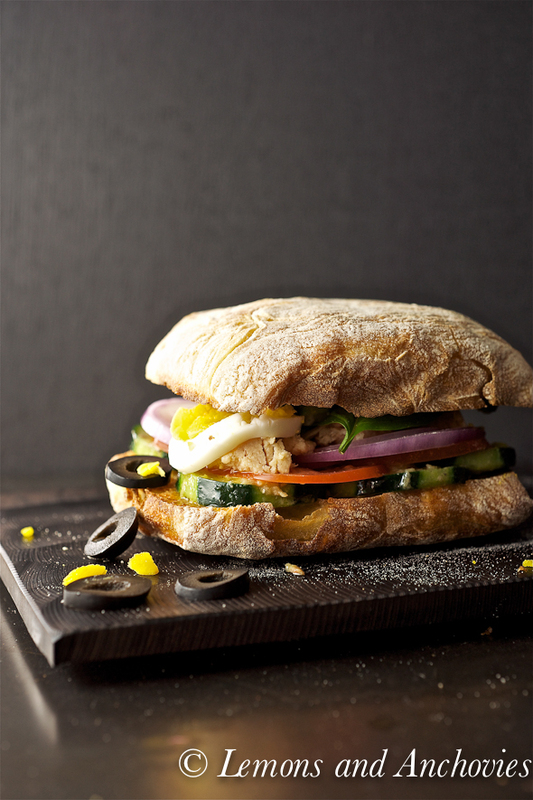 A pan bagnat is a Nicoise salad in sandwich form. Tuna, olives, a hard-boiled egg, onions and other vegetabes are bathed in an anchovy vinaigrette (pan bagnat means “wet bread”). It is a great make-ahead type of sandwich–sealing it in plastic wrap for at least two hours allows the flavors to meld–but it is also wonderful enjoyed immediately. This version from the New York Times has the added distinction of being pressed thin (I used my cast iron meat press) so that the vinaigrette disperses all over the sandwich. 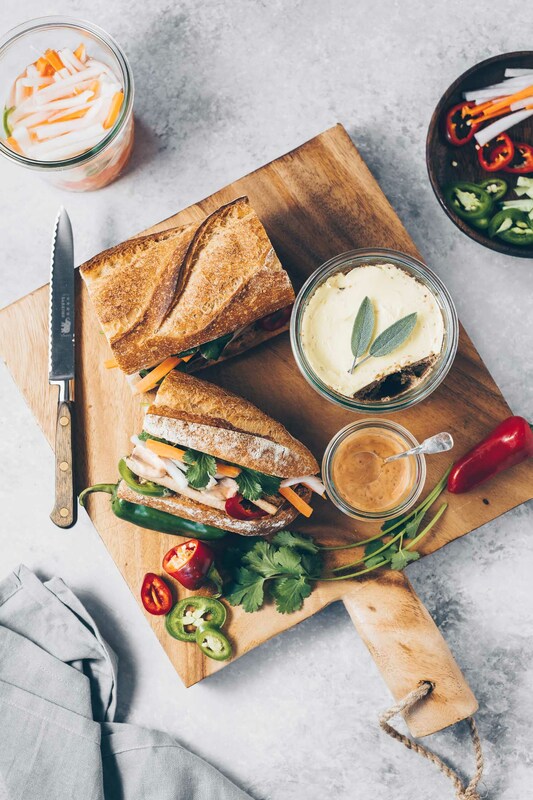 The crusty ciabatta (I toasted mine first) was perfect to hold the vinaigrette-drenched tuna, olives and vegetables–making for a flavorful, satisfying sandwich, sliced finger notwithstanding. Now excuse me while I go out to pick up a mandoline glove. 1 hard-cooked egg, peeled and thinly sliced. 1. Whisk together the anchovies (if using), the garlic, vinegar, mustard, salt and pepper. Slowly drizzle in oil, whisking constantly. 2. Slice cucumber thinly then add to vinaigrette and toss well. 3. Spread half the cucumbers on bottom of bread. Top with tomato and onion slices, then with tuna, basil, olives and egg slices. 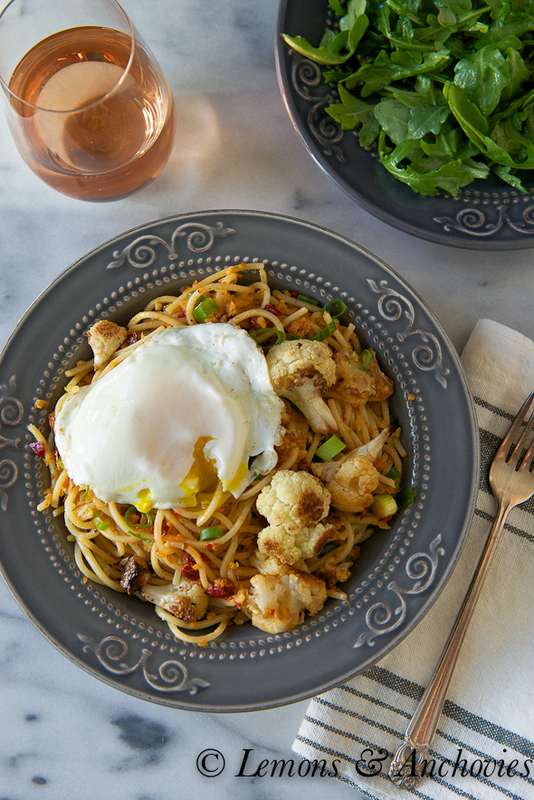 Top egg with remaining cucumbers and vinaigrette. Cover with second bread half and firmly press sandwich together. 4. Wrap sandwich tightly in foil, waxed paper or plastic wrap, then place in a plastic bag. 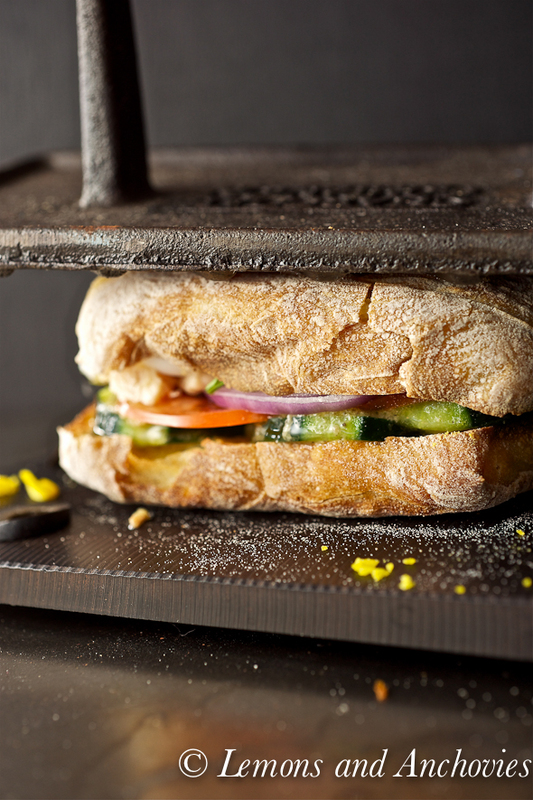 Put sandwich under a weight such as a cast-iron frying pan topped with a filled kettle. Weight sandwich for 7 to 10 minutes, then flip and weight it for another 7 to 10 minutes. Unwrap and serve immediately, or keep it wrapped for up to 8 hours before serving. The sandwich looks out of this world!!!! Your photos (as always) are absolutely stunning! I truly need a lighting lesson! I hope the finger is doing better, I’ve done similar. My mom used to cut herself almost bi-yearly and my dad would have to take her to get stitched up. A fantastic sandwich!! And beautiful pics…. I think it was worth it!! 🙂 Feel better! Kim, thanks so much! I’m still learning so much about lighting–it’s really been one of my biggest challenges in photography. However, I don’t think that’s been a problem at all with your pictures! So sorry to hear about your finger, at least you don’t need stitches! Your pictures are amazing!!! Ouch! I’m sorry about your hand!!! Yummy sandwich! i don’t think I have ever craved a sandwich as bad as I’m right now! 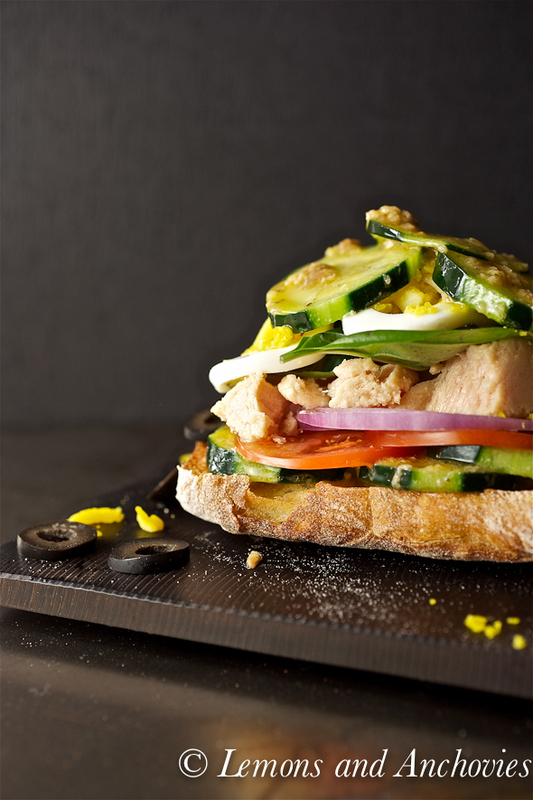 This sandwich is packed with awesome goodies. Despite the fact that you sliced the tip of your finger, the veggies are beautifully cut. I feel like I’d see this sandwich in a top-selling cookbook! Jean – your photos are breathtaking!!! I am awwwww. This sandwich looks amazing and I bet it tasted even better. Hope your finger is okay! 🙂 Have a great weekend – the weather should be just perfect! 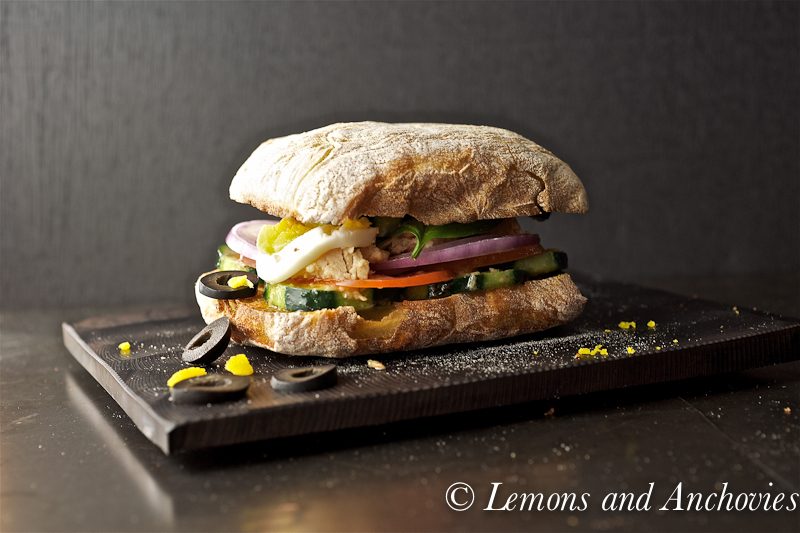 Gorgeous photos – love all the textures in one sandwich! The ciabatta looks delicious as well (I’m such a bread lover!). I have a mandoline and agree – it is quite tempting to forgo the veggie holder. Ah, I always hear how dangerous those mandolines can be – so glad to hear you didn’t need any stitches. Now as for your sandwich, I would love a bite! Kevlar gloves are fantastic when you’re using a mandolin. In a pinch I’ve been known to use an oven mitt. The sandwich looks fantastic! I’m glad it was worth the sacrifice. Jean, your photos keep getting better and better. This sandwich is out of this world gorgeous. Liren, that is so nice of you to say, thank you! Jean, I’m so sorry you almost lost your finger! I have done it a couple of times as Japanese meals often require very very thin vegetable pieces…and back then there was no fancy vegetable holder! I can totally imagine the scene and just thinking about it remind me of pain. Hope it will heal faster. Besides this accident, this sandwich is so perfect. I love Nicoise salad and make it often at home, but never knew about pan bagnat! I already love it because this is one of my favorite salad. Your photos are stunning! Looks like they came from a magazine! Your photo is stunning~ Sorry you endangered your finger playing with the mandoline, I am scared of this thing, almost did not use it for a year after I bought it! I have a book on niçoise cuisine written by the famous (and infamous) Jacques Médecin, who was mayor of Nice among other things, and he admonishes people who use anchovies AND tuna; he says the authentic version is one OR the other. He says people in Nice were poor and could not afford both. He is long gone now, so it really does not matter as long as the taste is good and yours look DELICIOUS!!!!! Craving for this GORGEOUS sandwich now!!!! 🙂 Hope your finger is ok!! I can’t believe how identical this is to the pan bagnat that my husband made up from his memories of childhood. Why can he duplicate something from 30 years ago, but can’t remember anything I tell him? Oh no, I’m so sorry about your finger. I hope it doesn’t hurt too much. Your sandwich is gorgeous and making me hungry! Have a great weekend. Ouch! I saw Rick Stein on tv the other day saying he wouldn’t use a mandolin again because he nearly lost a finger. They are so sharp. I’m really glad you will keep all your bits. This sandwich though, if you had to make a sacrifice it might be worth it. Love the photos!!!! This sandwich looks gorgeous and soo very appetizing. Sorry about your finger. Hope it heals fast. We all have those “D” moments in our kitchen. I agree with everyone else these photos are magazine material. I also learned something new today – pan bagnat is a sandwich version of a Nicoise salad which I love. Sorry about the mishap, Jean. That could have been me. I am prone to these sort of things. Love the pan bagnat. Am a fan of salad nicoise so this is so my type. Love the rustic bread. My all-time favorite picnic food! Thanks for sharing. I was half expecting to see some nice red sauce mixed in wit this sandwich… I’m glad it doesn’t! Hope your finger is okay! I only recently made pan bagnat myself, and LOVED IT! Why don’t more diners serve this instead of turkey clubs? Beautiful photos! Oh, this made me smile! I live in Nice and this really looks like a Pan Bagnat , but so much more delicious!!! Drool-worthy, soooo I’m drooling! AMAzing! OuCh, so sorry about your finger. The sandwich is a masterpiece! Oh no, I’m so sorry about your finger! I’ve had a similar experience in the past and now I avoid mandolines like the plague…they scare me, lol! The sandwich is truly a work of art and I love the idea of a Nicoise salad in sandwich form — delicious! I’ve managed to never cut myself in the kitchen (knock on wood). However, I am a burner. I always seem to grab a hot something or other at the wrong time. The dangers of being a home cook!! The sammich looks delicious 🙂 Making me hungry before lunch!! Oh no! Your poor finger. 🙁 I’m always afraid that I’ll injure myself on the mandoline one of these days… it hasn’t happened yet, but I’m so accident prone that it’s probably just a matter of time. All photos but particularly the first snap shot is stunning Jean. Great job & the Pan Bagnat looks incredible! Oh this looks gorgeous 🙂 What a great idea! This is a seriously beautiful sandwich if I ever saw one! I am sure it tastes even better than it looks :)! Congrats on the top 9! wow, nicely put together…and the photography is awesomely tempting!!! I will taste it with the anchovy and tuna combo in mind, as heightening one or the other??? Sorry you had to be the one to acknowledge the dangers of the mandoline, but thanks for the heads up. I love nicoise salad, I bet it’s super yummy in sandwich form. I lost the holder to my mandoline and have been too lazy to buy a new one. Needless to say, I keep cutting myself. This looks like perfection. I love all the layers on this sandwich. I can’t wait to try this. I’m pinning it! That sammy looks outstanding. Beautiful pictures. Love the styling!!! 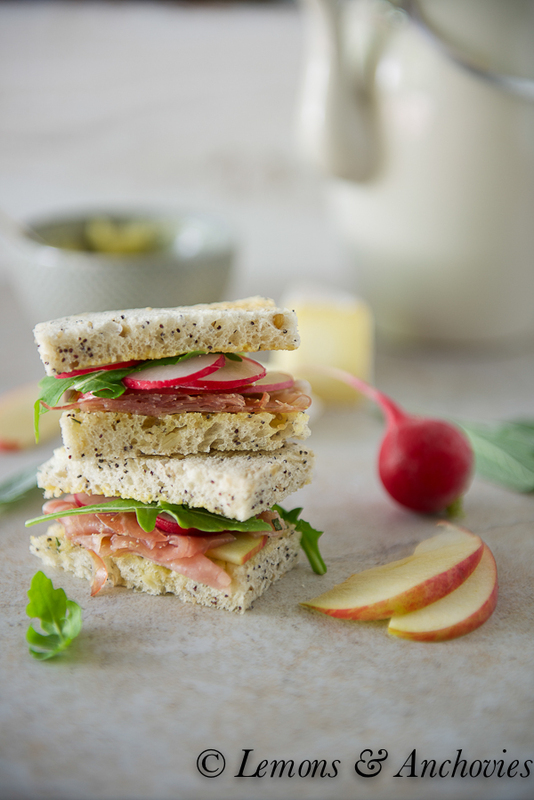 And of course, the sandwich is just gorgeous and lively! Surely, it must taste good! I am so sorry about your finger!I hope it is better now!I am always scared about cutting my fingers,I had a similar incident when I was in school,several years back,I was cutting cucumbers too,the difference being I was using a knife,not a mandoline. The pictures are very stunning!I am sure the sandwich tastes very delicious as well!Ciabattas look very fresh and fluffy!